Ernst, who launched her lawsuit in 2007, told The Tyee that she would appeal the decision. “I have no choice but to appeal,” said Ernst in an interview. “Chief Justice Wittmann ruled that the ERCB has a duty to protect the public, but not me. I am the public; we all are. Without water to bathe in, the public’s well-being declines — as mine has for years. Without water to drink, the public dies, so do all individuals — including Justice Wittmann and his loved ones. There is no frack worth that. When will you all see that this is about democracy? And what will we do when our aquifers are contaminated? Heck they may already be contaminated. Where are the water testing results? without the help of EnCana? as above the law of the land? are we ruled by bitumen masters? An Alberta Court of Queen’s Bench judge has ruled Ernst can’t sue the regulator because under provincial law it is immune from private legal claims. Ernst says she plans to appeal the ruling, and says the lawsuit against Encana and the provincial government will proceed. In its statement of defence, Encana denies all of Ernst’s allegations. “It is worrying that citizens are unable to hold the energy regulator accountable for failing to protect citizens from the harmful impacts of fracking,” Cory Wanless, a lawyer for Ersnt said in a release Wednesday. In a major new report, the International Network of Civil Liberties Organizations details a global crackdown on peaceful protests through excessive police force and the criminalization of dissent. The report, “Take Back the Streets: Repression and Criminalization of Protest Around the World,” warns of a growing tendency to perceive individuals exercising a fundamental democratic right — the right to protest — as a threat requiring a forceful government response. The case studies detailed in this report show how governments have reacted to peaceful protests in the United States, Israel, Canada, Argentina, Egypt, Hungary, Kenya, South Africa and Britain. 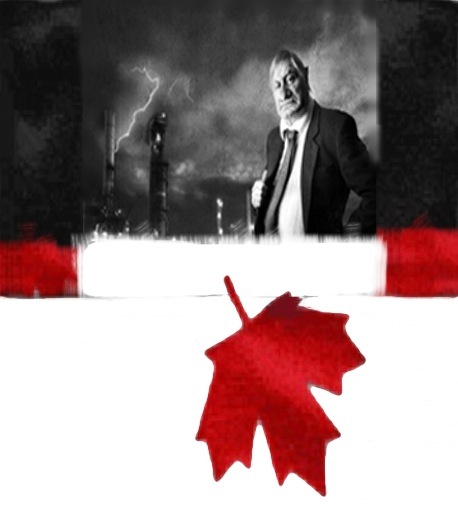 The report’s name comes from a police report filed in June 2010 when hundreds of thousands of Canadians took to the streets of Toronto to nonviolently protest the G-20 summit. May 1, 1998: Jessica Ernst takes possession of her property at Rosebud. Water well is excellent producer with soft, high quality water that caused no caustic burns to skin after bathing. 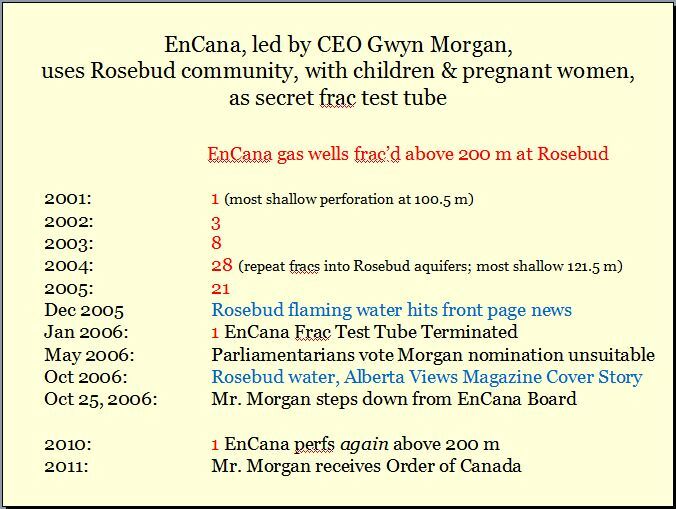 2001: Encana begins a secret experimental shallow fracturing natural gas project arond Rosebud, without consulting with the community or landowners in violation of EUB (now AER) Directive (then Guide) 56. June 2003: Encana’s first un-attenuated compressor installed about 900 metres from Jessica’s home, without consulting her about it, in violation of Guide 56. The noise was like a jet engine taking off, 24 hours a day, 7 days a week, worse at night and in winter, because noise rises with heat. Encana continues to violate Jessica’s legal right to quiet enjoyment of her home and land. Had Encana complied with the regulator’s Noise Control Directive and consulted with the community, the compressors could have been located where their noise would not amplify off the coulee walls in Rosebud and into the natural amphitheatre on Jessica’s land. February 14, 2004: Encana perforated and on March 2, 2004 hydraulically fractured directly and secretly into the drinking water aquifers that supplies the Hamlet of Rosebud, the Ernst water well and others. 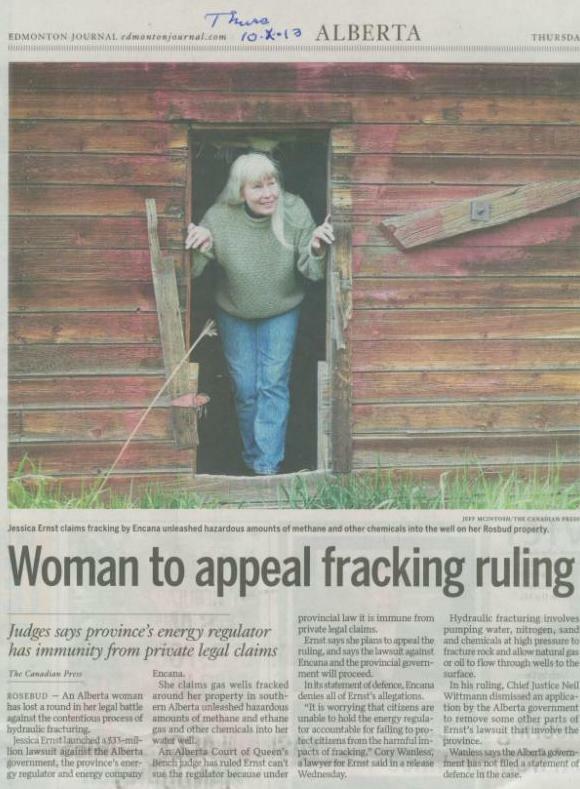 August 2004: Jessica finds out Encana lied to her and her community about a blanket approval document the company was pressuring area landowners and homeowners to sign. Jessica resigns in writing, from Encana. January 2005: The Hydrogeological Consultants Ltd. report is completed for Encana with copies submitted to Alberta Environment, affected Rosebud citizens and reportedly the EUB. The report carefully details that Encana fractured the Rosebud drinking water aquifers.  stress and anxiety because of Ms. Ernst’s inability to get playground signs installed in Rosebud on Highway 840 adjacent to Rosebud’s playground to protect citizens from speeding petroleum related traffic – blanket approval comes first so as to speed up down-spacing applications for industry and the EUB; safety of Alberta’s children is made to wait a year or two and comes last. Our client is of the view that CBM remains an unknown at this time. In order to protect Alberta and its citizens, it is imperative that CBM is regulated responsibly, slowly and with caution. November 24, 2005: EUB (then ERCB, now AER) letter by Jim Reid to Ernst, judging Ernst making criminal threats, copied the Royal Canadian Mounted Police without any evidence, no charges laid, no fingerprints taken by the police, no trial, and excluded her and her dangerously contaminated water well from energy regulation. December 6, 2005: Ernst letter to Jim Reid at the the EUB, requesting clarification of the regulator judging her making criminal threats and banishing her. Ernst sent her letter via xpresspost so it was registered and trackable. December 13, 2005: On the same day as Ernst gets her letter back from the EUB, refusing even her registered mail, Ernst’s contaminated water is featured on the Front Page of the Edmonton Journal (interview and photos of the explosive water on December 6, 2005). Alberta Environment suggested bacteria were to blame. March 3, 2006: Alberta Environment tests the Ernst water well and advises her that they cannot provide her water tanks for their promised alternate safe water delivery because “industry has all the tanks.” Without seeing the results first, Alberta Environment water well tester Al Straus blamed Ernst for the dangerous methane contamination in her water because she does not run cattle and thus does not use enough water. He also advised Ernst there was a serious problems with the water production in her well but refused to include this data in the test results. The Office of the Privacy and Information Commissioner’s Office later (in 2008) advised Ernst that Al Straus threw these data away because of no control on the well. June 8, 2006: EUB lawyer Rick McKee interrogates Ernst; tries to get evidence after the fact and bully her into only speaking with the regulator and not the press and asked her what it will take to get her to leave Alberta. Ernst replied she will gladly leave Alberta as soon as the regulator starts to do its job. February 12, 2009: “undercover” Royal Canadian Mounted Police with Canada’s anti-terrorist squad arrive warrant-less at Ernst’s home to interrogate. October 1, 2011: UNANIMA International presents Jessica Ernst with Woman of Courage Award at the UN Church Center in New York City. 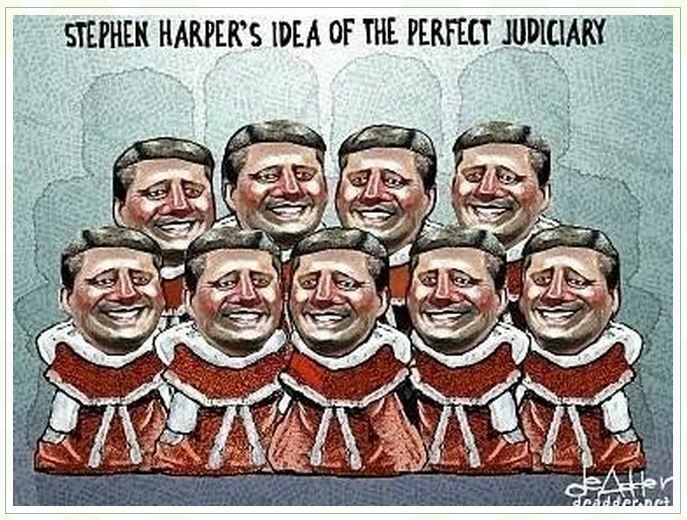 April 26, 2012: First hearing in Drumheller Court of Queen’s Bench. Justice Veldhuis requests shorter statement of claim and volunteers as case manager. ERCB lawyer Glenn Solomon demands the original statement of claim is removed from the court and public record. Denied. October 1, 2012: Defendants demand the case is moved to Calgary during a case management call with Justice Veldhuis (moving the case was not on the agenda). Justice Veldhuis advised that according to Chief Justice Wittmann, the case is to be heard in Drumheller. Encana lawyer advised they will not drive to Drumheller. The case is subsequently moved to Calgary by Justice Wittmann. January 18, 2013: Second court hearing, in Calgary. The court room is packed, not enough seats, some attendees were directed to an incorrect room, some left. Encana did not argue to have the case struck; the company website states that the case has no merit. February 15, 2013: In a case management call with Justice Veldhuis, it was relayed that Alberta Court of Queen’s Bench Neil Wittmann volunteered to take over the case. The other option offered was to allow the three defendants and plaintiff to choose a new judge which would have been a long drawn out, unjust, expensive process for Ernst. September 19, 2013: Justice Wittmann’s ruling on the hearing he did not hear, gives the ERCB complete immunity, even for violating Ernst’s Canadian Charter of Rights and Freedoms; rules there is no evidence that Ernst is a terrorist; denies the Alberta Government’s attempts to get the word “contamination” removed from the statement of claim, or paragraphs mentioning the other contaminated water wells at Rosebud. January 13, 2014: Case management call. After three years, Justice Wittmann grants the Alberta government another chance to try to get my case thrown out. Hearing set for April 16, 2014. Case is moved back from Calgary to Drumheller, where by law, the case belongs. February 3, 2014: Ernst Appeal Factum filed in Alberta Court of Appeals, hearing set for May 8, 2014 in Calgary. Because the Charter is part of the constitution, no part of it can be changed by a federal or provincial government. 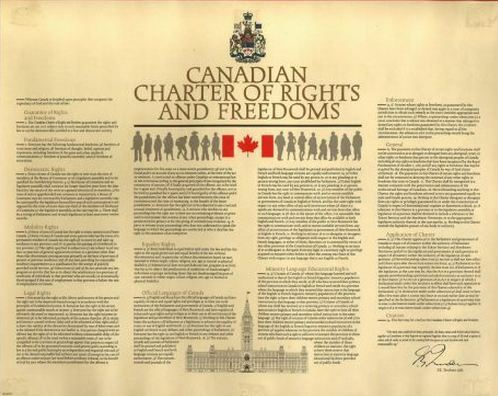 The House of Commons, the Senate, and two thirds of the provinces representing over 50 percent of Canadians must approve any changes to the Charter or any part of the constitution.What is the Canadian Charter of Rights and Freedoms? It is a document that protects the interests of Canadians and provides a way to challenge perceived abuses of basic rights and freedoms through our court system. … A right is a legal, moral, or social expectation that Canadians are entitled to from the government. For example, a person accused of committing an offence is entitled to a lawyer and a fair trial within a reasonable amount of time. A freedom is a right to live your life without interference from the government unless you impinge on the freedoms of others. Rights and freedoms are not without limits. Sometimes they have to be limited in order to protect the rights and freedoms of others. For example, prisoners have some of their rights and freedoms taken away because they have broken the law. 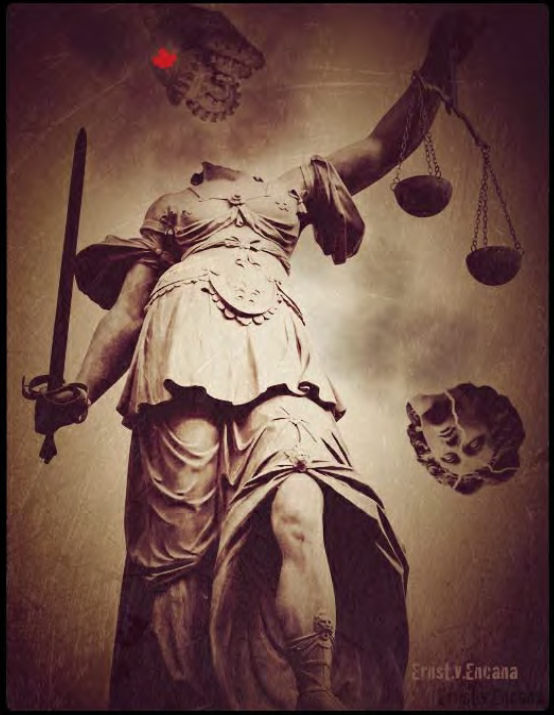 Everyone has the right to a fair trial within a reasonable time.